Anyone familiar with Chad Underwood's work knows this is an incredible find! Built for Destroy All Guitars, a boutique/art guitar dealer, they call this Strat-Tele hybrid a Telestar. There's so much cool stuff about this guitar and it's builder, I'm just gonna include most of the seller's description below. "Here is a DAG Telstar built by Chad Underwood for Destroy All Guitars. These are guitar guitars no longer available that combined the best elements of a strat & tele to make an awesome feeling and playing guitar. Pickups are wound by Jason Lollar specifically for these guitars. This one has the reverse angled Tele bridge pickup/middle tele/neck tele. It has a beautiful relic'd butterscotch finish. Sounds and plays great! These are getting hard to find so don't miss out!..." "...About Chad: Hailing from Lexington, Kentucky, Chad Underwood has been quietly cementing his reputation as the bolt on builder of choice for the likes of David Grissom, Paul Reed Smith (yes that Paul Reed Smith, who currently owns several of Chad's guitars), Texas blues legend Anson Funderburgh, Matte Henderson, Rob McNelley (Delbert McClinton), as well as several other extremely talented high profile players. What sets Chad's instruments apart from the pack are his tireless attention to the most minute details, coupled with a deep knowledge of and passion for the classic '50s to mid '60s Fullerton masterpieces. The burnished quality of an Underwood will feel immediately familiar and second nature to even the most demanding vintage fanatic. Rounded fretboard edges, effortless playability, extraordinary resonance, low end response and seemingly endless sustain are the hallmarks of Chad's guitars. Chad's patented nitrocellulose lacquer based finishing process lovingly and faithfully recreates the feel and visual appeal of a played in 54 year old guitar. Destroy All Guitar's commitment to bringing you only the finest, had us on nearly a year-long quest to find that special luthier who could fill the shoes of one who could build the finest aged looking and feeling Fullerton style bolt-on style guitars. One who's build techniques, commitment to and passion for his craft are second to none. A tall order to fill but we firmly believe we have found all that and more in Chad Underwood. About the guitar: Our first model, "The Telstar", is a blending of what we believe to be the finest elements of the two most popular Fullerton designs. With a compound radius body mixing the tummy-cut, arm contours and rolled edges of a Strat on the (top) bass side, with the squared edge and shorter horn of a Tele on the (bottom) treble side, we have created a body shape that provides greater comfort and better posititioning and balance when played either standing or seated. We feel we have taken the best of both to bring you the ultimate in a bolt on body. All bodies are made from one piece ultra light, extremely resonant swamp ash, unless requested otherwise. Our necks are all made from flat-sawn rock maple, complimenting our one piece ash bodies for the absolute best tone. They feature 22 frets to the body and all have our superbly sculpted heel providing complete and easy upper fret access. Our standard neck has a 12" radius and we will gladly tailor thickness to your specifications from .84 at the nut on up. The overall scale length is set at 25.5" at the end of which you'll find our headstock which features Gotoh Kluson staggered adjustable height locking tuners. These staggered height tuners eliminate the need for string trees while adding unparalleled stability in regard to tuning. They also make it possible for you to bend behind the nut to your hearts desire. At the heart of the machine you will find either a standard Tele style vintage "double-cut" bridge-plate made of stainless steel, with 3 compensated brass barrels, for our "Hardtail" edition, or you will find a Glendale Chimemaster Tremolo with a cold rolled steel block and 3 compensated brass barrels for our "Tremolo" edition. Both the Hardtail tray and Trem bridge suppoort a Tele bridge pickup. 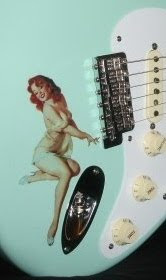 You may add to this your choice of almost any combination of a strat or tele middle pickup, and a Strat, Tele or Humbucker neck position pickup. All pickups are built by Jason Lollar specifically for Chad Underwood and Destroy All Guitars. > By blending and bending the strongest points of the two most popular 50s Fullerton guitars we have created a truly unique offering. While most the elements are borrowed, they were never quite assembled in this manner. We present this model to you as we feel it to be a vital and significant variation on a theme. One that we feel offers more comfort and greater tonal variation by incorporating the strongest elements of what's come before with just a twist of the new.